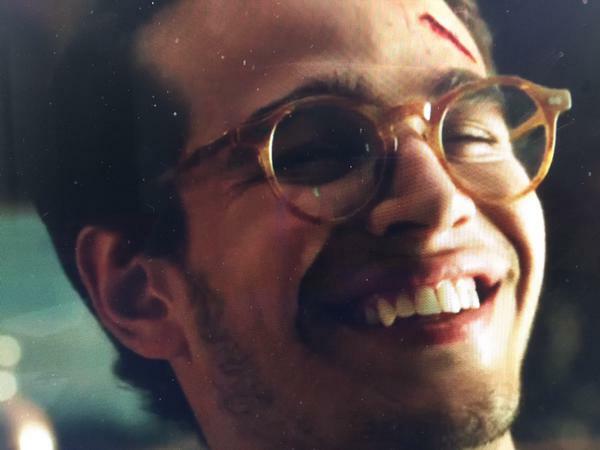 These new photos from the set of Shadowhunters’ third episode have us wondering if Simon is about to be acquainted with the vampires of Hotel Dumort. Showrunner Ed Decter shared a couple of photos from the set, including a drunk Simon (drunk on what is the question), as well a look at a vampire who might be Camille (or Raphael), who looks pretty thirsty. If they are following the book, Simon is drunk on the spiked blue(?) drink served at Magnus Bane’s party. The one that Izzy told him not to touch. Let me just say that drunk simon is… Adorable. And I love the first look at our vampires fangs! Why are they styling them so strangely? Alberto is cute but the facial hair is awful. Just gross and distracting. So is Dominic’s and his haircut is awful. I’m worried it’s like the movie where they had beautiful people but no idea at all how to make them look good. Here’s praying that this has anything at all to do with the party and the blue drinks. My feeling is that it’s completely unrelated. Simon didn’t get drunk at Magnus’ party, he just got turned into a rat. It was a shame they left that out of the film. I hope they don’t leave it out here, but given the addition of Camille I’m not optimistic. Hopefully that with the church scene they do it like in the book. Because in the movie Isabel and Alec went with Jace and clary but really in the book it was only jade and clary who went after they went back to magnus’s place to ask where the vampires lair was and where the church was. Also Camille was never in the city of bones book. Only Raphael. They gotta get their facts straight. If they are gonna make a show based on a book then do it right and follow the book. I probably sound pushy but it’s true. Because if they want the show to continue and be popular they should follow the book because that’s ken of the reasons the movie bombed. I am pretty excited, maybe this is right before he turns into the rat…? I am hoping.